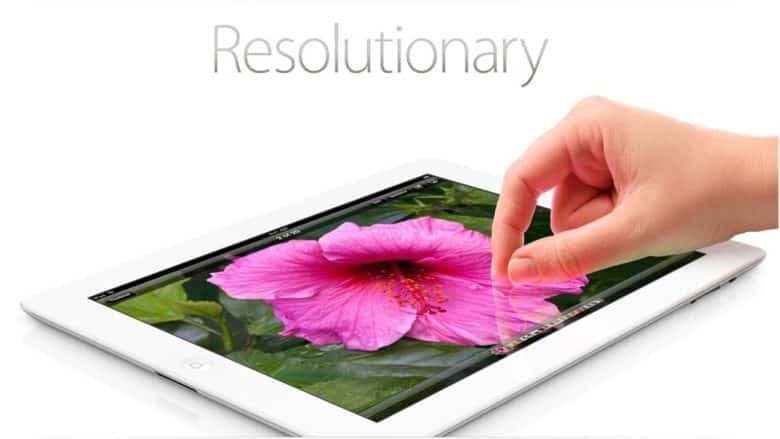 The arrival of the Retina display proved great for iPad buyers. Now they could enjoy astonishingly crisp visuals on the new tablet’s 9.7-inch screen. Apple introduced the Retina display with the iPhone 4 in mid-2010, making its arrival on the iPad both inevitable and highly anticipated. In fact, the 264 pixels per inch was a lower density than on the iPhone. However, users typically hold iPads further away from their eyes than iPhones. That meant Apple could stick with its “Retina” marketing term. The iPad 3 also supported some pretty great features. Hardware improvements included a 5-megapixel camera, HD 1080p video recording (with software-based image stabilization), dictation and support for LTE networks in North America. In the marketplace, the device did very well, selling 3 million units in its first three days. This represented the pinnacle of Apple’s dominance of the tablet market. Apple manufactured more than 60 percent of all tablets bought during Q2 2012 worldwide. By contrast, today Apple captures around 24 percent of the market. Not everything about the iPad 3 met with universal acclaim, however. The first iPad became the fastest-selling new product in Apple history, and the second one improved on that. The iPad 3 marked the first time Apple faced an issue it continues to grapple with: How do you make a new iPad compelling each and every year? Some reviews took on the almost begrudging tone you see with modern iPhone reviews. The reviewer knows the new device is better than its direct predecessor, and can’t therefore award it a lower mark, but struggles to get too excited about it. The iPad 3 was evolutionary, not revolutionary. At the time of its launch, some customers expressed disappointment that the iPad 3 measured thicker than its predecessor, while otherwise sticking almost exactly to the design of the second-gen iPad. The fact that it didn’t come with an A6 chip, as had been heavily rumored, was also a bit of a letdown. The biggest criticism of all? Siri didn’t make it onto the device, despite having been marketed as a big selling point of 2011’s iPhone 4s. This was in the first few months following Steve Jobs’ death, so every Apple product was being scrutinized to draw out larger points about new CEO Tim Cook’s approach to fresh products. Ultimately, the greatest disappointment with the iPad 3 was just how short a lifespan it had. Apple debuted the fourth-gen iPad just 221 days after the iPad 3 went on sale. The iPad 4 added the Lightning connector (making the iPad 3 the last iPad to support the old 30-pin dock connector), and featured Apple’s new A6X chip. Did you own an iPad 3? What are your memories of it? Leave your comments below.